About our Environment: Karpuravalli (in Tamil) / "Plectranthus amboinicus" once identified as "Coleus amboinicus"
Plectranthus amboinicus belonging to the family Lamiaceae commonly known as Country borage. This plant has fleshy leaves carries the flavour of camphor and hence the name in Tamil. The plant is distributed throughout world especially in India. It is cultivated in the gardens and can be grown in any climatic condition. It can be grown in pot too. Leaves of this plant has lot of medicinal values and used as natural medicine. 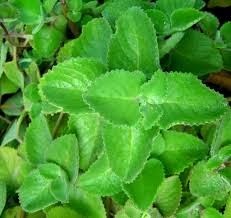 It is mainly used for treatment of colds and coughs especially for children. Raw leaves can be taken for throat infection, cold and coughs. It is used as cure for malarial fever, cough, chronic asthma. Studies has identified that these leaves extract has anti bacterial activity.